The Transportation and Telecommunications Committee heard a proposal Feb. 4 aimed at providing a better understanding of rural access to telecommunication technology. 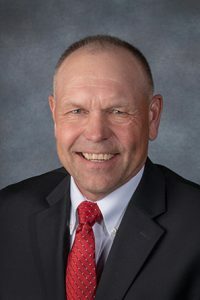 Plymouth Sen. Tom Brandt, sponsor of LB549, said the bill would provide a more accurate picture of who is being served in rural areas of the state. Currently, he said, mapping of high-speed internet access is done at the census block level, while his bill would require mapping of every street address or land parcel in a first- or second-class city, village or unincorporated area of a county. “Gathering accurate data is the first step in developing a strategy to close the widening digital divide in our state,” Brandt said. As an example of the current disparity, Brandt said there is fiber optic cable buried on the highway right of way very near his home, but he is unable to access it and still must use a DSL connection for cable service. “It is like having a Ferrari in your garage but you don’t have the keys,” Brandt said. • connection speed and type of technology available at each street address or parcel of land. Brandt said he would bring an amendment to use the Nebraska Universal Service Fund rather than state general funds to pay the estimated $862,000 annual cost for the next two years to develop and manage the system. PSC Commissioner Crystal Rhoades testified in support of the bill, saying there have been major delays in the routing of 911 calls in her county—including three that resulted in deaths—because operators could not identify where a call was coming from. Kristen Gottschalk, representing the Nebraska Rural Electric Association, also spoke in favor of LB549. She said much of the current information regarding telecommunications coverage is self-reported by companies and overrepresents high-speed internet service in rural areas of the state. Speaking on behalf of the Nebraska Cable Communications Association, Julia Plucker testified in opposition. Telecommunications companies already provide substantial data through reports to the Federal Communications Commission, she said, which could be used to achieve the bill’s purposes. “The granular information required in LB549 is not practical or efficient for the companies and would be challenging to provide,” Plucker said.